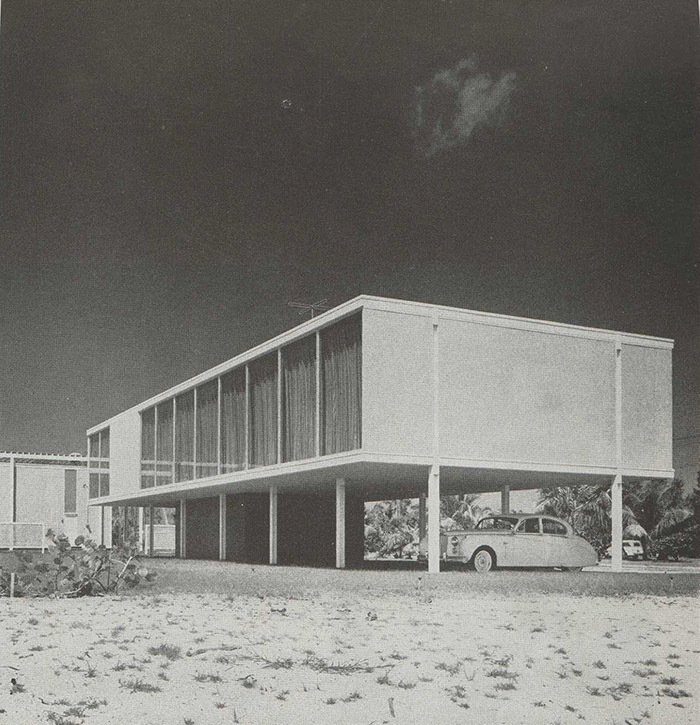 In 1953 Philip Hiss, developer, author and one time chairman of the Sarasota School Board, commissioned Tim Seibert to design a studio and private library to house his book and drawing collection. It was one of the first fully air-conditioned homes in Lido Shores. Hiss stated in the July, 1954, issue of House and Home magazine ?Air conditioning is expensive—though when I consider the damage to furniture, draperies, books, clothes, etc. due to salt air and moisture, I wonder how expensive it really is.? Its geometric shape, modern simplicity, and open spaces make it iconic of the Sarasota School of Architecture. With views in mind, the home was built on fourteen thin, steel columns and with floor-to-ceiling glass. An open tread stair led to the living area above that contained freestanding and wall bookcases. The 1962 addition by Bert Brosmith is at ground level and to the rear of the studio. Private gardens and courtyards complete the footprint of the home.